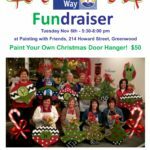 Join us for a fun night of painting Holiday door hangers to benefit the United Way. All hangers come with a wire, bow and are ready to hang. 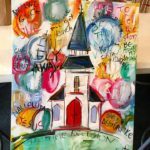 Open Paint Night – Your Choice! No, you don’t have to paint the picture shown. When you arrive, choose from anything in our gallery! 16×20 paintings are $35 and 20×20 are $40. Kids paint for $25 for small canvas and teens for $30 for medium canvas. Add them to your order when you get to the checkout page.